The most popular cocktail in the United States, the invention of the Margarita is both controversial and happily celebrated. The taste is timeless and the recipe, simple. Tracking down the real history of the Margarita is like trying to keep all its different flavors straight. It can be done, but there’s a lot of them to choose from. It is said to have been created for and named after Rita Hayworth (her real name was Margarita Cansino), singer Margaret “Peggy” Lee, and a nice young woman on her wedding day. Maybe it was created when a bartender didn’t know what a Magnolia was and improvised. Or maybe a bartender took a liking to a girl named Margarita and mixed together her favorites to form the splendid cocktail. The most common story, or the most well known story, surrounds a woman named Margaret Sames. In 1948, in Acapulco, Mexico, she was determined to make up her own drink. Her favorite alcohol was tequila, so she decided to mix up a cocktail using it and another favorite of hers, Cointreau. After several unsuccessful attempts, she decided to put the two together with some fresh lime juice. Being a tequila lover herself, she knew that salt often went with tequila, so she added salt to the rim of the glass, served the combination with some crushed ice, and the famous mix was born. Soon after her invention, her husband purchased some martini glasses with her name, Margarita, etched in the sides, and the name of the drink was solidified. Sames claimed that the popularity of the cocktail was due to her relationships with several rich and famous people in the hotel and bar industries. Whether this is true or not remains to be seen; however, the drink was only seen in bar books starting in 1953, giving it a good five years to gain popularity and giving credence to her claim that she was the inventor of the drink. Another popular story of the Margarita’s origins says that Carlos Herrera, owner of the Rancho La Gloria in Tijuana, Mexico created and named the drink for dancer and sometimes actress Marjorie King in the late 1930’s. King was allergic to all liquor except tequila and since she didn’t like the drink straight, Herrera invented the drink for her. 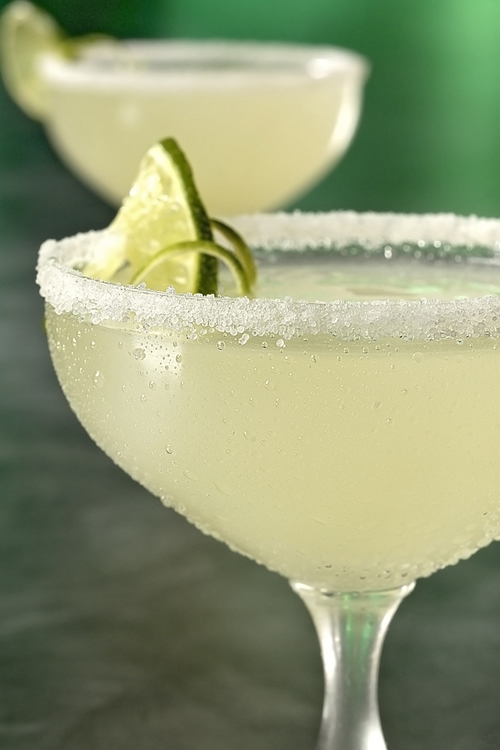 No matter what the story, one thing is true of all; the original margarita consisted of three main ingredients: fresh lime juice, cointreau or triple sec, and good tequila, and most of them added a little salt to the rim of the glass. Mix tequila, Cointreau, and Lime Juice with ice in a shaker or blender. Rub rim of a chilled Margarita or Martini glass with a piece of lime. Dip the rim of the glass in a saucer of salt until it is evenly coated. Strain mixture into glass and garnish with a slice of lime.